Görres-Druckerei und Verlag GmbH is based in the German town of Neuwied. The family business specializes in high-quality offset and digital commercial work, folding cartons, displays, and mailings. It deals with everything from very short, customized print runs to high six-figure runs. As Görres sees it, digitizing all the company’s processes and combining them with creative print solutions is the key factor in shaping its further growth. Görres regards product solutions and sales as the company’s core areas of expertise, and Heidelberg Subscription enables it to concentrate on these activities. “As a print service provider, we need to focus on looking after our customers and their products, and on continuing to develop our company and new product solutions. That means we want to spend less time on optimizing production resources and processes, purchasing and testing consumables, dealing with software, coordinating service and maintenance contracts, and planning training measures. Our partner Heidelberg will take care of this in the future,” says Managing Director Marc Spitzlei. One particular advantage of the subscription model identified by Spitzlei is that his company and Heidelberg have a shared interest – boosting productivity and cost efficiency on the customer’s side. “We both benefit if targets are met or even exceeded. This model provides us with a sound basis for planning and managing our business that prevents nasty surprises and also aims to improve performance,” he explains. By opting for a subscription contract, Görres also immediately opened the way for a number of investments that were originally scheduled for 2019 and 2020. The aim was to combine as many requirements as possible in one package. In addition to a new Speedmaster XL 106 with LE UV technology, this meant also incorporating the Versafire EP digital printing system and a Suprasetter 106 CtP platesetter, including customized consulting concept, in a single pay-per-use contract. Expectations are high at Görres. “With the Heidelberg subscription model, we’re looking to reduce the administrative outlay for print production by up to 80 percent, while also improving performance and quality. This will provide a solid foundation for our further growth,” says Spitzlei. Görres has also concluded supply agreements for consumables for its existing equipment. This means the Heidelberg Assistant will automatically plan and monitor the consumption of all production materials. Görres-Druckerei und Verlag GmbH is impressed by Heidelberg Subscription. 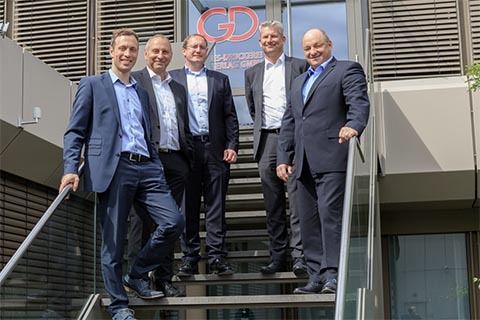 From left to right: Marc and Arnd Spitzlei, Managing Directors of Görres-Druckerei und Verlag GmbH, Dr. David Schmedding, Head of the Customer Segment Management & Subscription Business at Heidelberg, Andreas Lang, Managing Director of Heidelberger Druckmaschinen Vertrieb Deutschland GmbH (HDD), and Alexander Schuster, member of the HDD Management Board.